Homemade laundry detergent sounds like a really big deal, but you’d be surprised by both how easy, and how effective it is. Granted, it’s not Tide, but it’s still good stuff. Certainly as good as cheaper detergent brands. I’ve been very happy with how my clothes and diapers are coming out. The stains come right out of the diapers, and while Garrett’s socks will never look the same after his treck through the compost pile, they don’t look half bad either. The kicker is that it’s so cheap. The fels naphtha soap is the biggest expense at $0.97/bar. The other ingredients include borax, baking soda and washing soda, all of which are usually available at large grocery stores. Of course, if you’re like me and want to make it on the spur of the moment but don’t have washing soda around, you’ll be interested to know that you can make washing soda from baking soda very easily by baking it for 20-30 minutes. Check out this recipe for full details. One thing I am disappointed about is that I still have to buy soap ( the fels naphtha) to put in it. I’d really like to make it completely from scratch to avoid. I’d been told, though I don’t remember where, that ivory soap could be substituted for the fels naphtha so I tried that first and it didn’t work at all. After two loads of laundry, I was pretty discouraged with my home are detergent and was ready to give up. Fortunately my sister remembered that I’d been looking for fels naphtha and picked up a bar for me in case I hadn’t found it yet so I added it. Ah, the manic ingredient. So, want the recipe? Here ya go! Grate the soap into a saucepan. You can use either a box grater or a food processor for this. I recommend you do not use whatever tool you use for grating soap with food. I was able to buy an extra food processor very inexpensively at a thrift store. Add 4 cups of hot water to the pan. Simmer on low until the soap melts completely into the water. Add borax, washing soda and baking soda to the hot water. Simmer on low until it desolves with the soap. If the mixture is not melting, add more water if needed. Let cool overnight. You will notice that it turns into a thick gel. 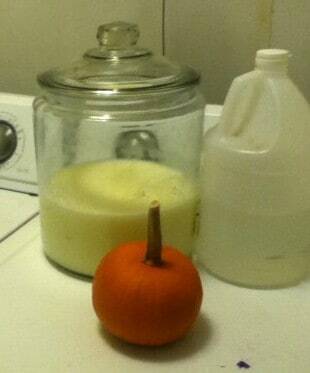 Use 1 cup of this homemade laundry detergent per load of laundry. I actually used half the ammount of water called for, and use 1/2 cup per load. It takes up less room that way.